This tutorial is for Half Rectangle Triangles or HRT’s. 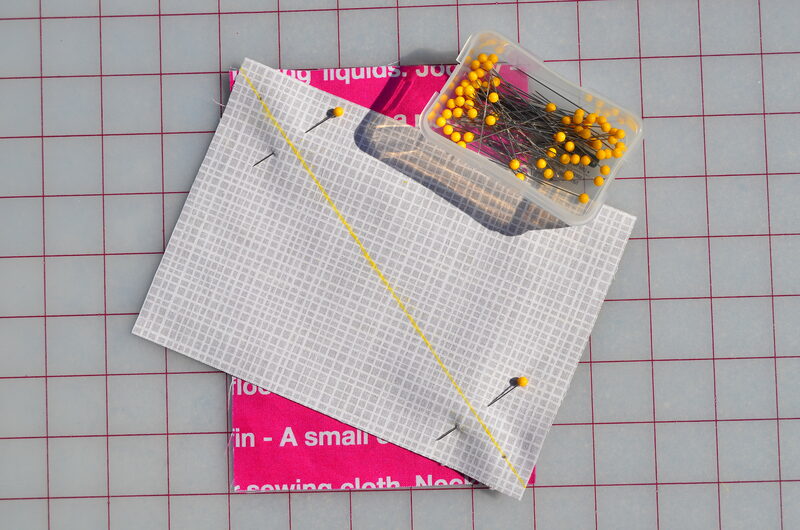 This will add another tool to your quilting toolbox and hopefully you will be able to create some fun modern quilts using the HRT. When this tutorial was first posted it didn’t have instruction for “squaring up” these blocks and some of you were having a bit of trouble with it. 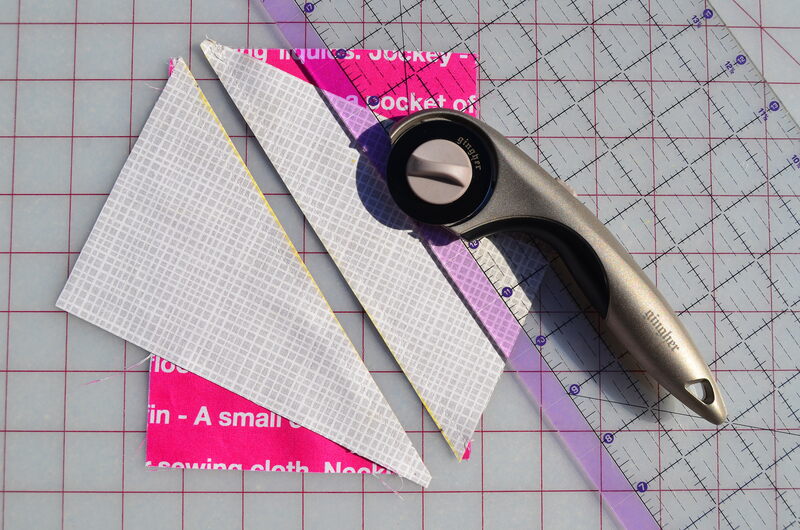 This updated tutorial includes not only instructions for “squaring up” but, also it adds an extra step so that when you square up your HRT you will only have to trim it a little. 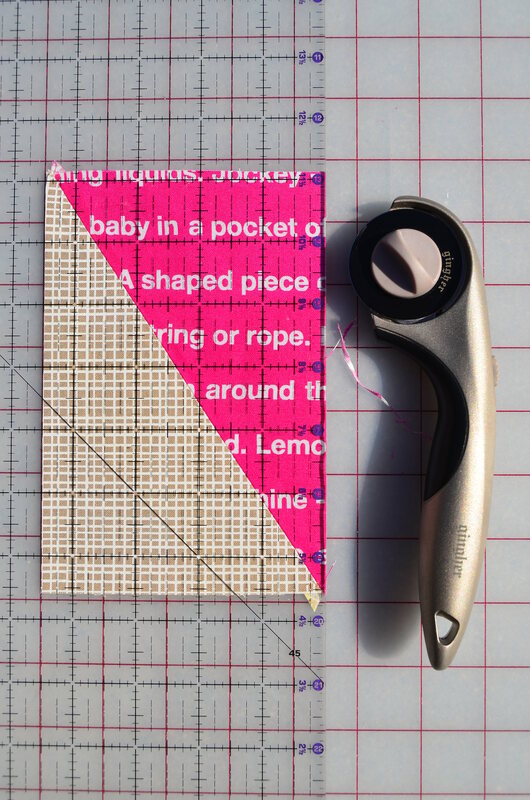 This tutorial will result in 4.5 x 6.5″ final block size so that you can easily follow along to learn this technique but, ANY SIZE rectangle will work as long as you use the same size rectangles. It has been tested on long skinny rectangles – 4.5 x 21″ – and after squaring up the final size was 4 x 20 3/4″ losing 1/2″ from one side and only 1/4″ from the other! Unfortunately, I don’t know the formula for what size block you’ll get relative to the starting dimensions of your block but, it should be 1/4″to 1/2″ smaller in either direction. When changing the dimension drastically, make a sample block to test it out. 1. You will need a 1/2″ guide. 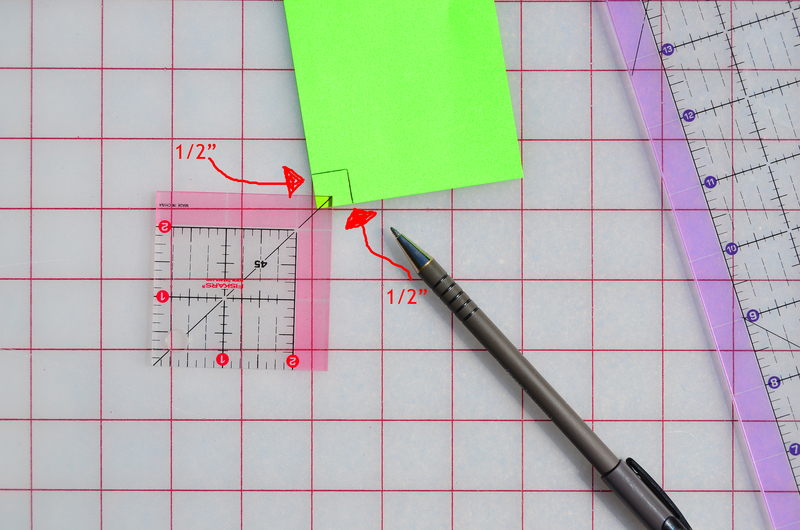 If you have a ruler that is easy for you to see then use it. Otherwise you can make a guide from an index card. 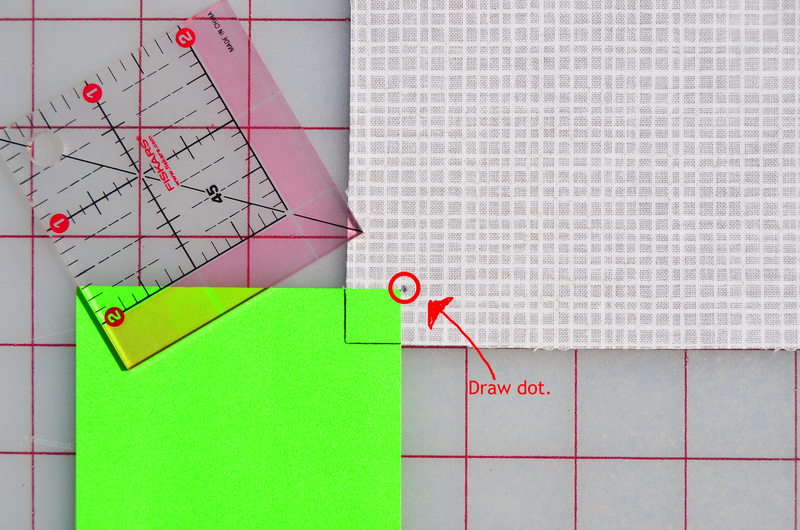 Simply mark 1/2″ from both edges of the corner of the index card. 2. 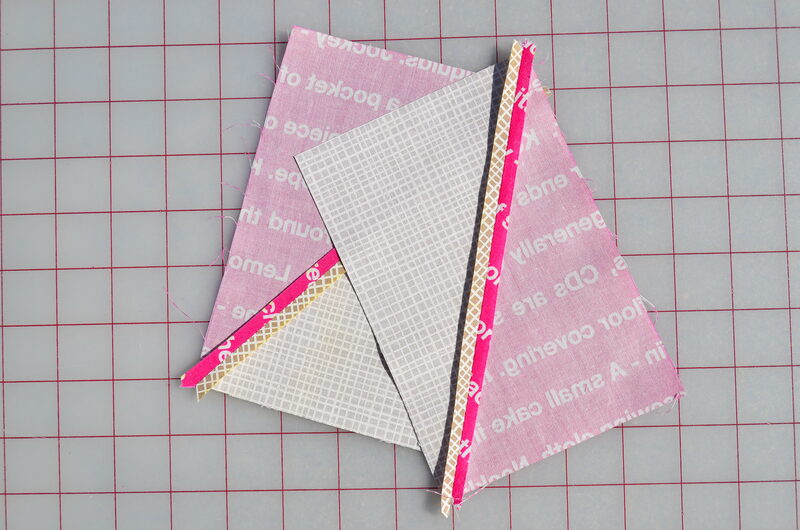 Lay out both pieces of fabric. 3. Flip the left piece so the wrong side is facing up. 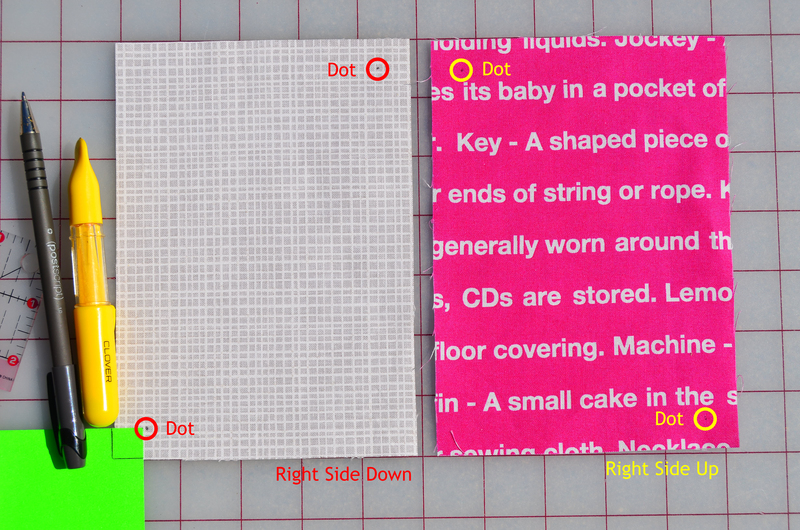 Using the index card guide draw dots on the LOWER LEFT and UPPER RIGHT of the face down fabric on the left. And draw dots on the UPPER LEFT and LOWER RIGHT of the face up fabric. 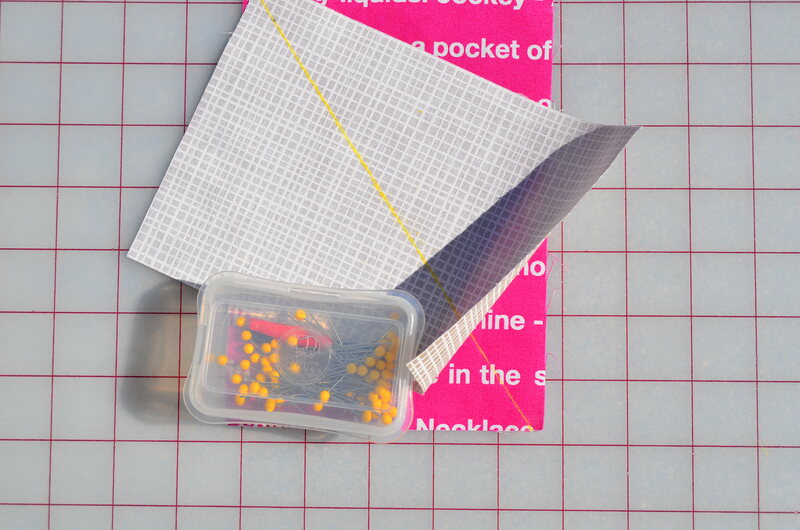 Since these dot will be well into your seam allowance, it doesn’t matter what type of marking pen that you use. 4. 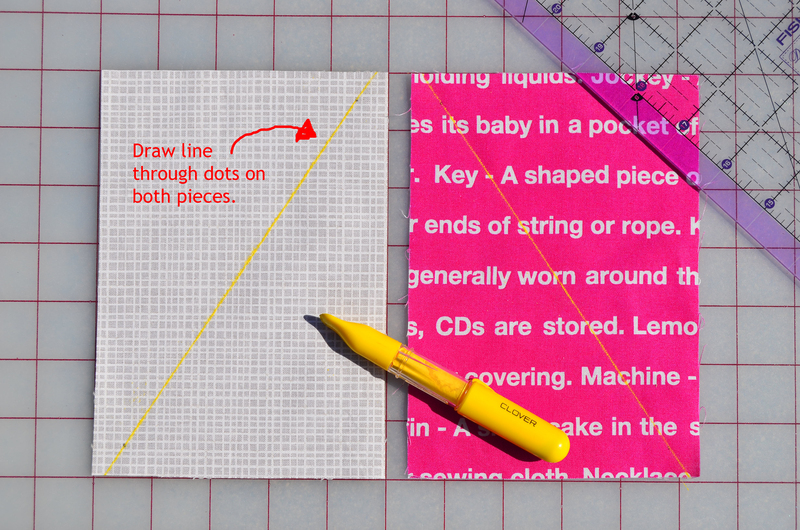 Draw a diagonal line that connects the dots on each piece of fabric. 5. Lift the face down piece and rotating to the left slightly place on top of the face up piece and match the diagonal lines. 7. 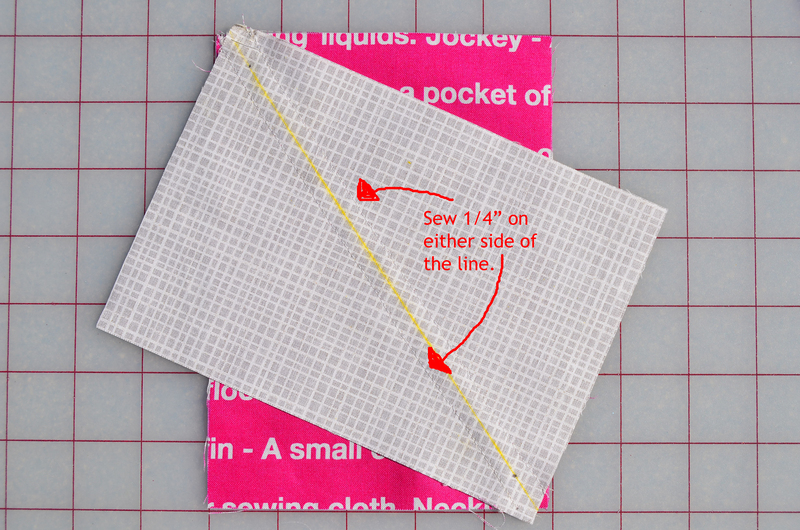 Using the diagonal line as a guide sew a seam 1/4″ on either side of the line. 8. Cut on diagonal line. 9. Open blocks and press. 10. And you have two HRT’s! 1. First you want to make sure your long edges are straight and parallel. As you can see, they should be pretty close and may just need to be trimmed a little. 2. Trim. Rotate and repeat on opposite side. 3. Rotate block 90 degrees so that it is laying on it’s side. 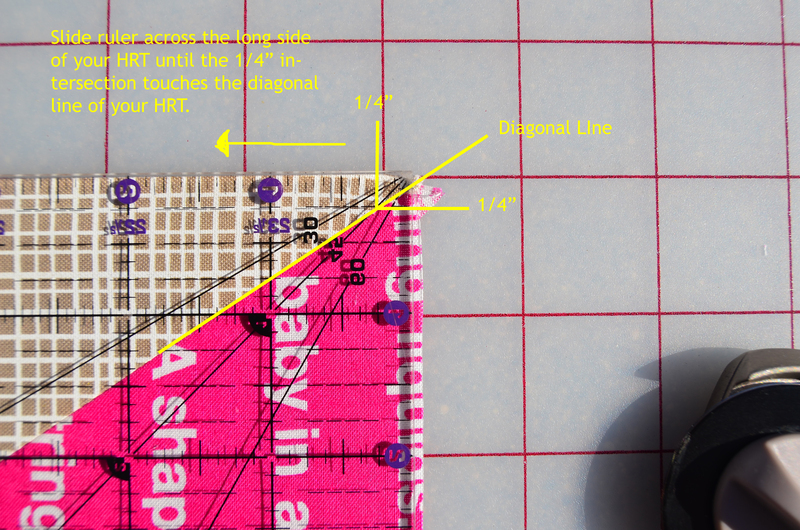 Keeping your ruler lined up with the long side, slide ruler across the HRT until the 1/4″ intersection touches the diagonal line of your HRT. 5. Rotate and repeat on opposite end. 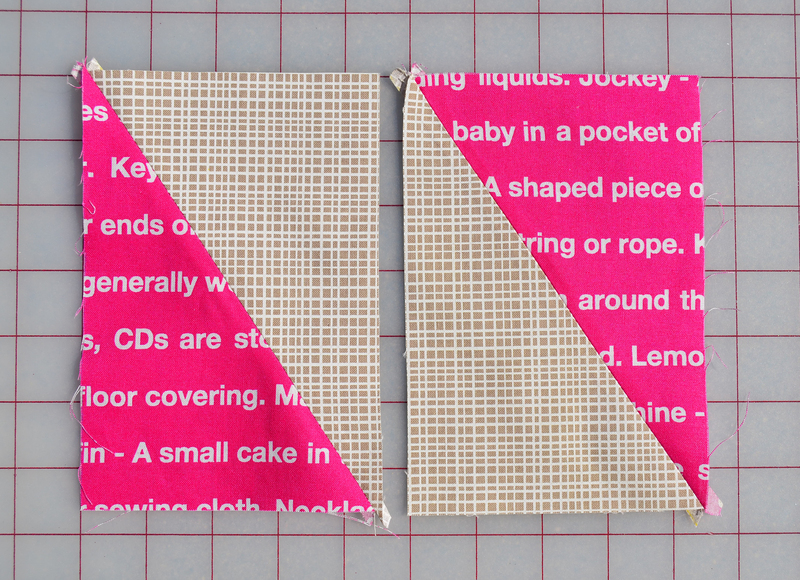 Note: Unlike Half Square Triangles, your diagonal line will be in the same orientation on both of your finished Half Rectangle Triangles no matter how you turn it. To make a set of Half Rectangle Triangles with a diagonal line in the opposite direction steps 3 and 5 will be different. 3. Flip the left piece so the right side is facing the cutting mat. 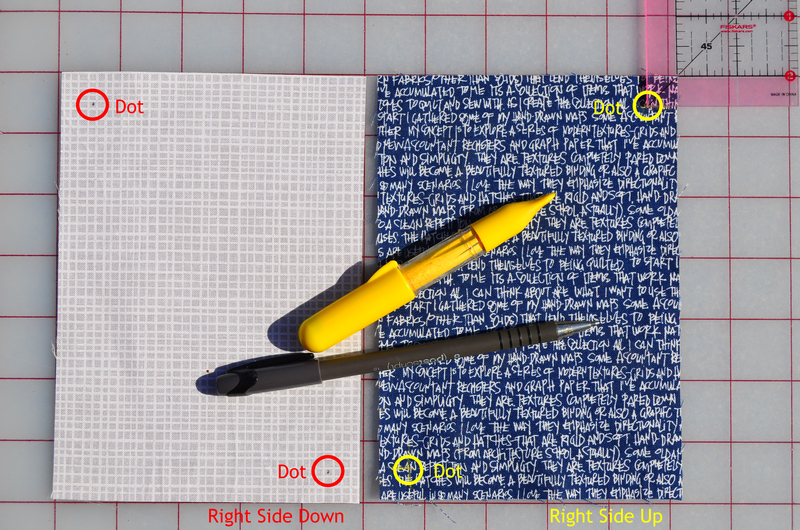 Using the index card guide or the half inch intersection on your ruler draw dots on the UPPER LEFT and LOWER RIGHT of the face down fabric. And draw dots on the LOWER LEFT and UPPER RIGHT of the face up fabric. 4. Draw line through the dots on each of the pieces of fabric. 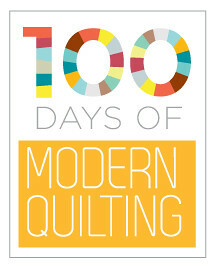 Note: This tutorial was written by MQG Board Member Latifah Saafir who blogs at The Quilt Engineer. I had no idea this was so easy to do this way! Thank you so much! So easy, once you see how it’s done. Thanks so much, a new technique to add to the arsenal! 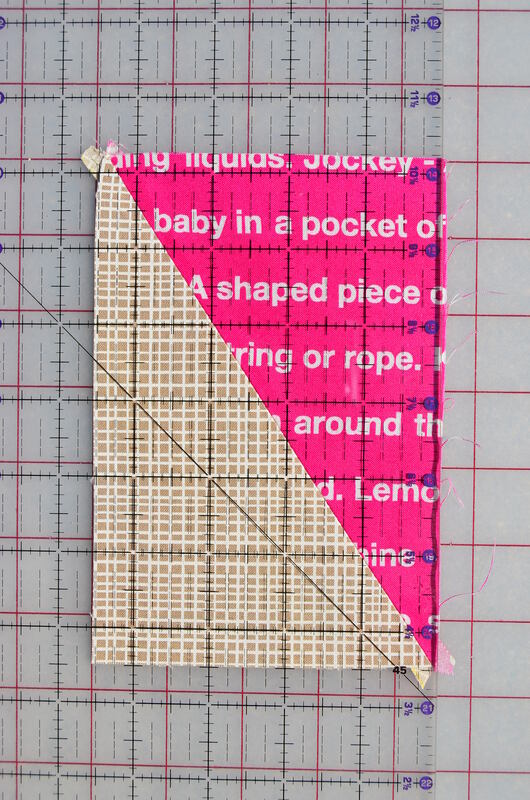 have been quilting for a long time and have never seen this technique. can’t wait to try it! Never thought of this…thank you so much for teaching us this!! Love it and now know what I’m going to do next with some left over pieces. I LOVE this! It’s so simple, but something I probably never would have thought of. Thanks for sharing! This is brilliant! Can’t believe I’ve never seen this before (or realized how it was done). And different size/proportioned rectangles will make an infinite number of unique designs! How cool! Thanks MQG! 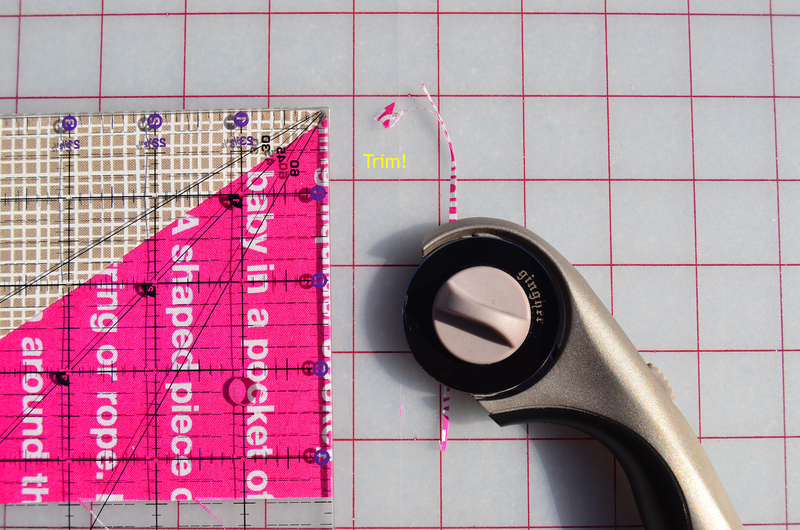 Love this idea – something to do with being a math teacher as well as a quilter. Great stash buster idea. I’ve ALWAYS struggled with half rectangles. I’m blown away how easy this is! GENIUS! And the grey-pinky-yellow-red combo… GORGEOUS! I am having a major “duh! !” moment. The is soooo awesome. Thank you! Thank you so much for this very cool tutorial. I’m echoing Joan S. I have been quilting a long time and have never seen this before. My test pieces were cut at 7″ by 4″ and I ended up with 6 1/2″ by 3 1/2″. I’m off to make some more! Ah!!! You can do it this way! Way too easy! Love it. This is so neat! I made up a couple and love them. Thanks for sharing! I’ve been waiting for just the right shapes for my christmas fabric. I have a stack of fat quarters of solids with gold pattern printed on them. It will be excellent against black! Thanks!! So simple compared to other techniques I’ve used. Thanks. Brilliant! Will make these so much easier. Fantastic block. Thanks for sharing. 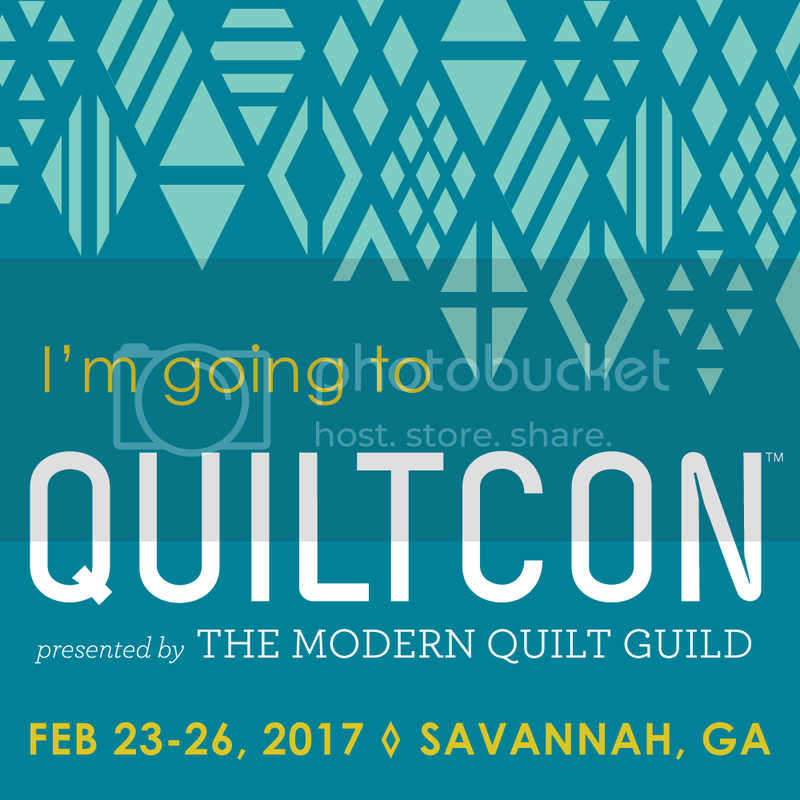 I love using quick methods and sharing them with my quilt guild. May I use this for the block of the month to be published in our guild newsletter giving you full credit for the block? A nice trick. Would love to try sometime. Great quilt design to show off those lovely fabrics. Thanks for sharing. I tried this and it worked perfectly! I just happened to need a rectangle 4 x 6. How did you come up with the 5 x 7 initial cutting measurements? What is the formula for any other size rectangle? Do I just add an inch to each measurement? What if the sides are a different ratio such as 3 x 4? Unbelievable how quick and easy this one goes. Great tutorial – many thanks for it ! Have put a single strip of these diamonds on the back of a quilt. Love it! So easy. I love this! I spent this morning sorting fabrics to make a scrap quilt, and I think this might be the one! Thanks for the tutorial! What a fantastic pattern ! Really like it. I have just one question: if I wanted to have the bocks a bit bigger, how do I calculate how to square the block up ? Thanks a lot ! I’m sad, because this doesn’t actually work in all cases as the diagonal line varies. 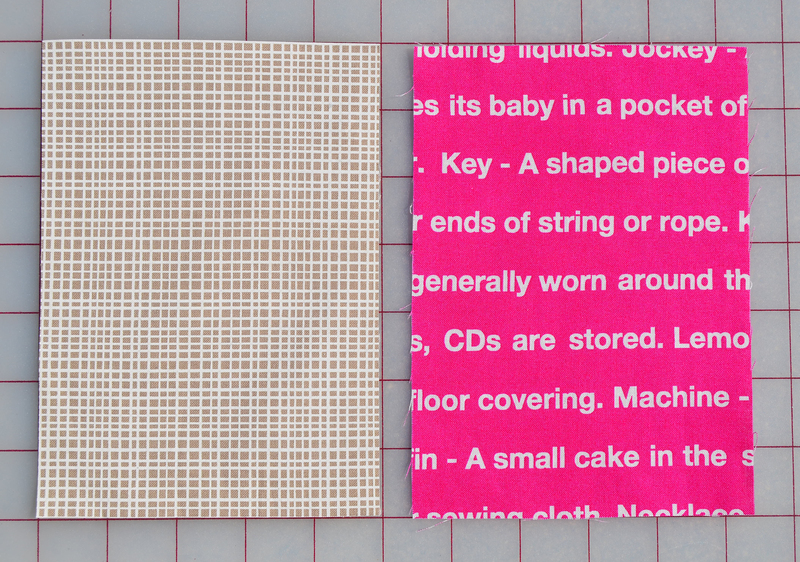 For example I just used this for finished size 9″ x 4″ block, so 10″ x 5″ rectangles. It joins with a huge seam allowance on the shorter sides but on the longer ones the point is so close to the edge it gets cut off if adjoining to the other side. 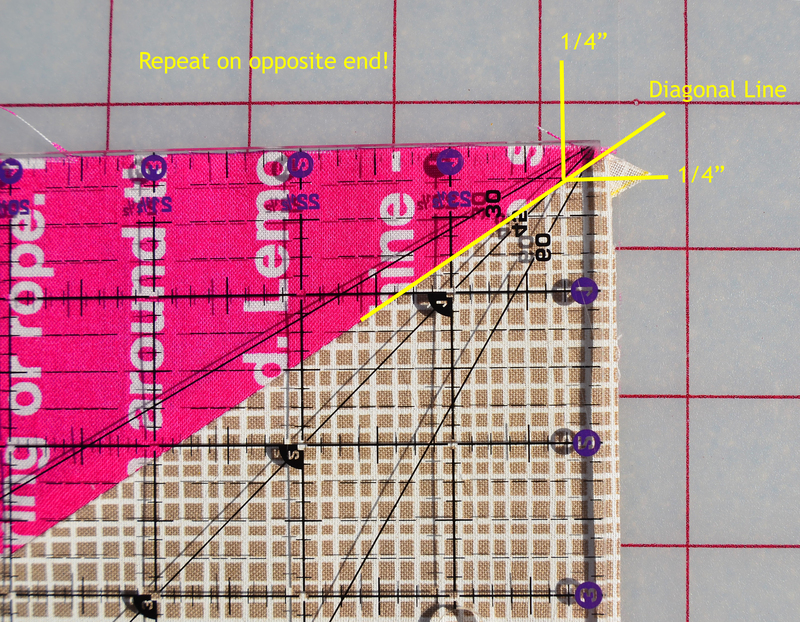 I’ve solved this problem by tripling the inner seam allowance but I doubt this will work for all cases, any idea on a maths formula to fix the seam allowance issue? Thank you! WOW! What a great tutorial! Thanks! Oh my! Just like that? See you laterer…off to my shed I go! I’m sad too Kerry – you are 100% right – it turns out exactly the way you say and my friend and I spent a sleepless weekend trying to work out how to succeed with it. My friend came up with a maths formula which seems to work. I’ll try to post it later. Has no-one else but us had any problems?? I can’t believe that it has worked out exactly right for everyone who has posted on here??!! Looks wonderful. I have never seen this technique before. Thanks for taking the trouble to post the tutorial. The tutorial has been updated to address the issues some of you were having. It now includes instructions for squaring up your block, which would have solved your problems. It also includes an additional step that makes the blocks more accurate.